: People tend to get confused between the Apso and the Shih Tzu, but there are a number of very distinct differences. 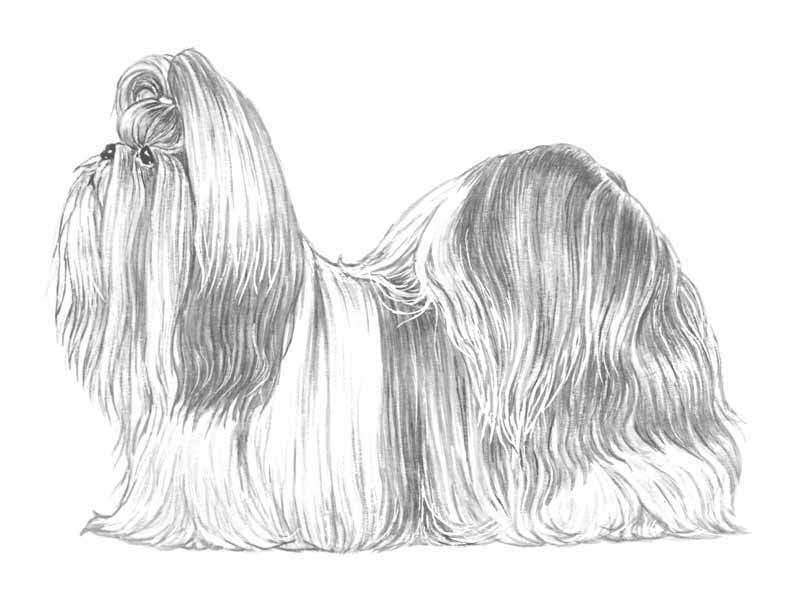 Roots of this breed are in Tibet but it was developed in China, where dogs like these lived in the imperial palaces. China became a republic in 1912 after which examples of the breed found their way to the West, though the first recorded importation to Britain was not until 1931. It was recognised as a breed separate from other Oriental breeds in 1934 and granted a separate register by the Kennel Club in 1940, with challenge certificates on offer from 1949. The chrysanthemum look to the Shih Tzu’s head is most appealing, and this is caused by the hair growing upwards on the bridge of the nose. : Sturdy, abundantly but not excessively coated dog with distinctly arrogant carriage and ‘chrysanthemum-like’ face. : Longer between withers and root of the tail than height at withers. : Intelligent, active and alert. Friendly and independant. : Head broad, round, wide between the eyes. Shock-headed with good beard and whiskers, hair growing upwards on the muzzle giving a distinctly ‘chrysanthemum-like’ effect. Not affecting the dog’s ability to see. : Black but dark liver in liver or liver marked dogs. Top of nose leather should be on a line with or slightly below lower eye rim. Nose level or slightly tip-tilted. Wide-open nostrils. Down-pointed nose highly undesirable, as are pinched nostrils. : Of ample width, square, short, not wrinkled; flat and hairy. Length about 2,5 cms from tip to stop. Pigmentation of muzzle as unbroken as possible. : Wide, slightly undershot or level (pincer bite, edge to edge). : Large, dark, round, placed well apart but not prominent. Warm expression. In liver or liver-marked dogs, lighter eye colour permissible. No white of eye showing. : Large, with long leathers, carried drooping. Set slightly below crown of skull, so heavily coated they appear to blend into hair of neck. : Well proportioned, nicely arched. Sufficient length to carry head proudly. : Well coupled and sturdy. : Broad, deep and well let down. : Heavily plumed carried gaily well over back. Set on high. Height approximately level with that of skull to give a balanced outline. : Firm, well laid back. : Legs short and muscular with ample bone, as straight as possible, consistent with broad chest being well let down. : Rounded, firm and well covered with hair. : Rounded, firm and well padded. Well covered with hair. : Legs short and muscular with ample bone. Straight when viewed from the rear. : Arrogant, smooth-flowing, front legs reaching well forward, strong rear action and showing full pad. : Outer coat long, dense, not curly, with moderate undercoat, not woolly. Slight wave permitted. Hair not affecting the dog’s ability to see. Length of coat should not restrict movement. : All colours permissible, white blaze on forehead and white tip to tail highly desirable in parti-colours. Not more than 27 cms. : 4.5 to 8 kgs. Ideal weight 4.5 - 7.5 kgs.